In small bowl, mix paprika, all-purpose seasoning and red pepper; set aside. In 12-inch skillet, heat oil and butter over high heat until butter is melted. Add chicken and half of the paprika mixture; cook and stir over high heat until chicken is white. Remove chicken from skillet; set aside. Add bell peppers and onion to skillet; cook and stir 1 minute. Stir in mushrooms, tomatoes and remaining paprika mixture; cook and stir 1 minute. 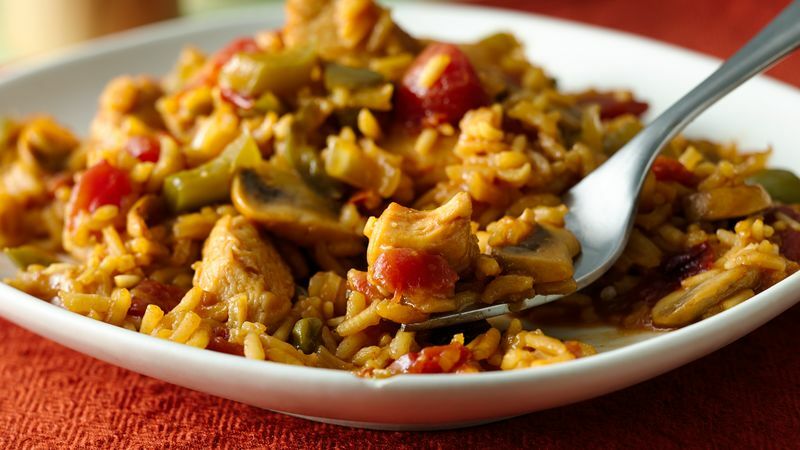 Stir in chicken, uncooked rice and seasoning mixes (from Chicken Helper boxes) and broth. Heat to boiling; reduce heat to low. Cover; cook 15 to 20 minutes or until rice is tender. Remove from heat. Let stand 5 minutes. Adobo, a Philippine seasoning made from ground chiles, herbs and vinegar, gives this dish a spicy kick. If you don't have adobo, you can leave it out and add 1/4 teaspoon chili powder instead. Flavor is the cornerstone of soul food. Generous amounts of onion, peppers of all sorts, herbs and spices bring out the smoky and robust flavors in cooking. In this recipe, paprika brings a slight sweetness to the dish as well as a boost of color.